Facebook is a massive platform with billions of users, making it unique in our time. Businesses that want to get ahead often choose to use it as a resource or a tool. Sometimes it’s for marketing, sometimes it’s for growth hacking, and sometimes you might want to take a slightly darker path. One such path is email harvesting. Facebook has been entrusted with personal information for billions of people, ranging from simple name and email all the way to incredible personal details. Facebook themselves have a rocky history with user information security and privacy. How many stories do you hear about people losing jobs because of their social media posts? That’s small scale stuff, too. At the other end, you have the entire Cambridge Analytica scandal. Despite this, Facebook has made it relatively difficult to simply gather user information. A business owner running a Facebook Page isn’t going to be able to simply export their audience contact information, for example. If you want to harvest email addresses, you’re going to need to employ some tricks. I’ve found a few options you might try if this is the goal you’re looking to pursue. Be aware, however, that they aren’t all going to work very well. Most of the options I’ve found basically involve scraping email addresses people have posted publicly. If you’ve ever seen someone type out their email address as “name AT gmail DOT com”, you’ve seen someone who knows emails can be scraped and is trying to avoid adding theirs to a list. Disclaimer: I am in no way encouraging you to scrape and mass-send unsolicited emails, regardless of how good your intentions or how few you send at once. Contacting one person you want to talk to based on information they have publicly posted is fine. Building a mailing list of thousands of people based on information they posted with no intention of giving it to you is spam. It’s pretty much exactly the definition of spam email campaigns, and if you’re trying it as a legitimate business strategy, it’s not likely to work. The exception to this is any option that involves the user opting in to your messaging and giving you their email willingly. When the user gives you permission to message them, then you’re in the clear. Otherwise, though, be very careful with what you’re doing. I don’t want to see any of my followers getting blacklisted for spamming people. 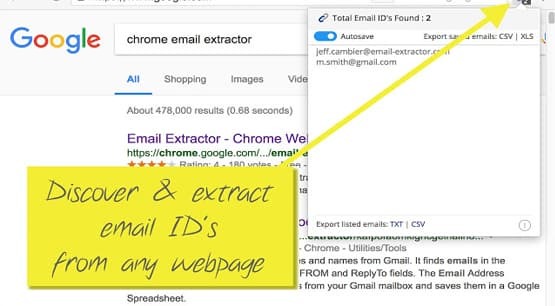 Email Extractor is an extension for Google Chrome. You can find it here. It basically takes a peek into the source code of any page you visit, looking for anything that resembles contact information. It usually looks for email addresses, but it can also detect phone numbers, links to the Yellow Pages, and a few other kinds of contact information. Importantly, it includes an auto-save feature, so you don’t need to manually hit a button to confirm the save of any email address it finds. To use it, add it to Google Chrome and configure it to save a .CSV wherever you want it to save. Make sure you toggle it on, then visit whatever Facebook Page or Facebook Group you want to scrape. Facebook lazy loads a lot of content in groups and on pages. They do this so you’re not trying to load an entire history of a page all at once. This means that most of the information won’t be visible, and won’t have loaded in, which in turn means that Email Extractor won’t be able to find it. What you need to do is simply scroll down to the bottom of the page. Once you hit the bottom, or come close to it, Facebook will trigger loading the next section of posts. Not many people post their email addresses in the actual post they make, but that’s fine. One thing you’ll notice using Facebook is that, when you hover over someone’s name, an infobox pops up. More importantly, in the About section for a user, if the user has listed their email address, it will appear. Email Extractor performs some wizardry to extract this information from the people who show up in the group or post on the page you’re scraping. Again, if you decide to send out a mass email to this list you’ve built up, this will pretty definitely be considered a mass spam mail and most users will either never see it, will ignore it, or might even report it as spam to their email provider. A second option that I’m going to cover very briefly here is Email Exporter. This tool is another Chrome extension and it does basically the same thing in the same way. As such, the process for using it will be identical. Install it to your Chrome add-ons list, turn it on, and visit the page you want to harvest. Continue scrolling through whatever group or page you want to scrape, until you feel you’ve gathered enough information. There’s not much difference between Extractor and Exporter. The primary difference is that Exporter will also harvest phone numbers more easily than Extractor. It has a slightly nicer user interface and can add additional surrounding information to the emails and numbers it harvests, to associate them with one another. You’re also given the option to export the data to clipboard rather than auto-save it, if that’s more suitable for your workflow. A third Chrome extension here. Much like the two above, this one scrapes publicly available data when you land on a page that holds it. It’s so similar to both of the above that I almost wonder if there’s a simple code base somewhere you can just take and file the logos off to get your own version. Honestly, there’s no significant difference between these three extensions, so it’s really down to what company producing it you prefer to support with your installation of their extension. They’re all free, they all work, there’s not much more to it. 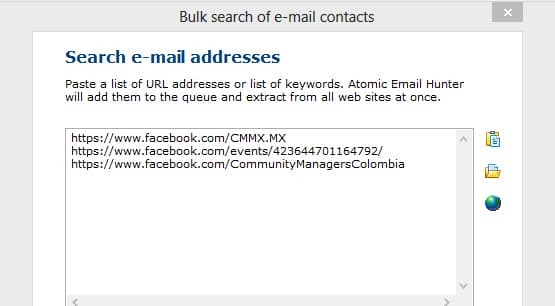 One thing to note is that with all of these public scrapers, they can only find email addresses that are visible on the page. Plenty of people have their email addresses associated with their Facebook pages, but have their privacy settings closed off such that they aren’t publicly visible. If a user hides their email address and hasn’t posted it plaintext in some post they’ve made, you won’t be able to scrape it. Rather than many another entry, I’ll just go ahead and mention here that there are probably at least a dozen more scrapers for Chrome. It’s one of the most-used browsers, with some of the easiest development processes, so it’s the primary target for people looking to make simple plugins. If you don’t like one of the scrapers I listed, you can find another, and you’ll have plenty of choice. The Atom Park Atomic Email Hunter is yet another email scraper, except this one works a little differently. It’s not a Chrome extension, for one thing. It’s a stand-alone app. Fortunately, it’s pretty simple to use. Launch the program and go to the Search menu. From there it asks you where you want to search, so plug in the URLs of the groups or pages you want to scrape. Tell it how deep you want it to scrape, and set any advanced scraping settings you want to keep. Then let it rip! Unlike some of the other tools on this list, this scraper will keep the email address, the source of the address, and the name of the user all associated with one another, whenever possible. This way you can know where specifically you got the email addresses, not just a list with no names or labels. The email scraper also has a Facebook-specific plugin you can use. You will need to authenticate the app using your account, which is unfortunately, so be careful. Any time you’re authenticating an app with your account, you’re giving access and control to an entity you might not fully trust. Make sure you’re willing to do this – and that you’re going to review your profile afterwards to see if it posted or made any strange changes – before you begin. 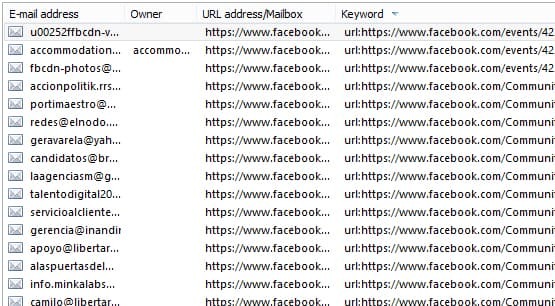 The plugin allows you to search for contact information specifically using keyword or name search queries and other Facebook search options. It can also access groups and other hidden locations that your account can reach, but a public viewer cannot. On top of all of this, it has an advanced search option. This option can search for more advanced words and phrases, and scrape the results. It’s all surprisingly robust. The primary downside to this program as opposed to the Chrome extenions above is that this one is not free. Chrome plugins are free. Atomic Email Hunter is an $80 piece of software. You can download it for free on their website, but it’s a limited version. You can fight with that if you like, or spring for a full license. Your call. If you don’t want a Chrome extension and you don’t want this specific scraper, there are some other options. Something like Scrapebox can do some work, as can ScrapeStorm. Like with Chrome, there are plenty of scraping alternatives. Some of them will work with Facebook right away, others might need authentication or a proxy list, and some won’t work at all. Feel free to look around. If you’re going to pay for a tool, and you want email addresses, why bother with some scraper some guy in a developing country coded up and is selling at a 1000% markup? Instead, just run some Facebook ads. With Facebook ads, you have three powerful advantages over using a scraper, regardless of whether it’s a free extension or a paid program. The first advantage is the ability to precisely target the kinds of people you want to reach. Rather than going to a Facebook Group or a Page and hoping the membership is amenable to your messaging, you can identify specific groups, interest sets, or target audiences and reach them specifically. You don’t get the cruft of abandoned profiles, dead emails, and other problems. 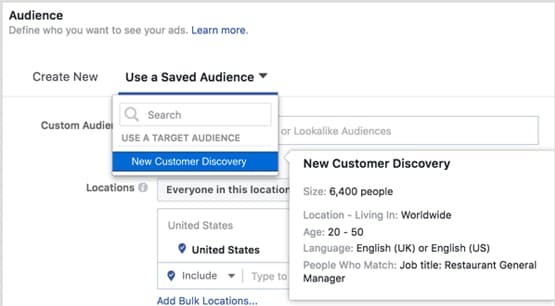 You can even target people who like a specific topic, interest, or group as part of your ad targeting. The second advantage is that you can reach people who don’t have public email addresses. With scrapers, you’re relying on people to publicly share their email address in their Facebook profile or in a post they make. 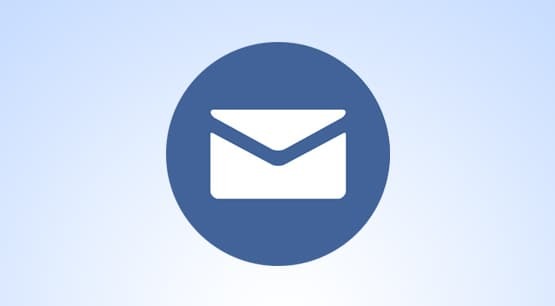 With a lead generation ad, you’re able to get people to give you their email address. In fact, using the lead generation ad format, the user can click a button and give you the email address they have associated with Facebook even if that address is otherwise private. You gain access to an entire audience all those other folks using scrapers won’t get. The third advantage is the opt-in. 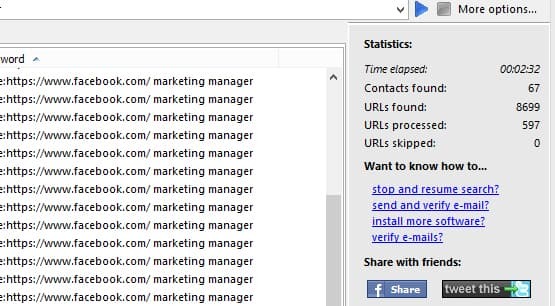 When you run ads, the only email addresses you harvest are the ones people give you. They come with an explicit opt-in to receiving messages. With scrapers, you run into the unsolicited email problem, where you end up being branded a spammer and losing out on most of your communication options. The disadvantage is that you have to pay for ads, and they only have a useful return if you know what you’re doing. On the plus side, if you’re already budgeting nearly $100 for some piece of software, you should be able to get a good list of emails for the same price. After all, nothing says you need to run ads for more than a few weeks, right?